Lakefront Home with Private Dock! Marty’s Lakehouse is a charming 3 Bedroom, 2 ½ Bath Vacation Home nestled in towering old growth Sitka spruce on the Eastern Shores of Woahink Lake. Be prepared for a calming, meditative experience- water & wind, sun & fog, surf booming in the distance at night. Feel what the Japanese call shinrin-yoku, also known as forest bathing. This comfortable home is geared towards being the home base for the retired, active professional, the perfect getaway for up to six people comfortably. 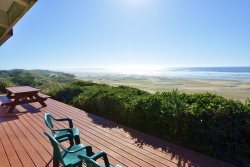 The central Oregon Coast/sand dune/freshwater lake ecosystem is truly an outdoor paradise, with Marty’s Lakehouse conveniently located approximately 10 minutes south of the coastal community of Florence, Oregon. A perfect spot to enjoy the coast, be it outdoors oriented (canoeing/kayaking/power boating, hiking miles of trails, beachcombing, photography, fishing, clamming, crabbing, sand dunes, storm watching), or the coastal culture of art galleries, fine dining and dive bars if you feel the need. The owners of Marty’s Lake House have been living, working and protecting the Central Oregon Coast since the mid-1960s and will provide you with unique suggestions for enjoying the hidden secrets of the area. The serene setting of the lake and beautiful sunsets of orange, gold and pink are the perfect way to relax and wind down the day of play on the Oregon coast. The large deck overlooking the forest and water is perfect for enjoying your morning coffee while taking in the sights and sounds of Woahink Lake. Bonus- be here during the spring (Late April-May)and surround yourself with a riot of color: wild & domestic rhododendrons as well as wild red-flowering currants incorporated into the mature and ecologically conscious landscaping. Bring your canoes and kayaks and enjoy the waters of Woahink Lake or launch your boat at the nearby public dock and test your skills, fishing for that trophy bass, perch or trout. Have a unique float from nearby Siltcoos Lake down to the Pacific Ocean. Or fish for salmon and steelhead in the ocean or numerous nearby rivers and estuaries. It is all here and more. This rustic two-level home is all about wood, comfort and views - cedar siding, birch paneling and exposed wood beam vaulted ceilings with cedar inlays, a fire place, and a full kitchen with amenities to prepare most of your favorite meals. The dining, living areas , and master bedroom open up to views of the lake and offer plenty of room for your entire group to relax and enjoy this Woahink Lake gem. No Pets/No Smoking. Not recommended for children or folks with major mobility problems. A minimum deposit of $150 is due at time of reservation!